Stray Kids, a super special idol group from JYP Entertainment, who successfully enlivened “Spotify On Stage 2018”, then came back to Indonesia. This time, Boyband, who won the New Artist of the year (album) award at the 2019 Gaon Chart Music Award, will hold their first tour in Jakarta, titled, Unveil Tour “I AM” on 26th January 2019, at Indonesia Convention Exhibition (ICE) Hall 5. 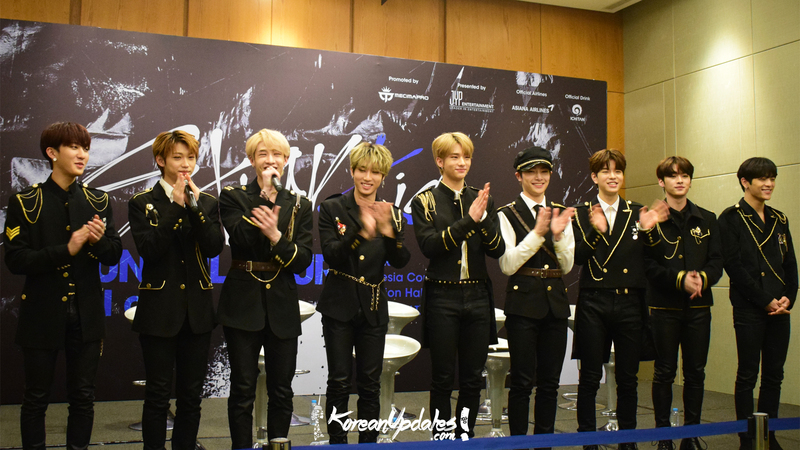 Before greeting fans through a concert, Stray Kids first greeted the media through Press Conference on January 25, 2019. Please introduce yourself in Indonesia! This is your second time in Indonesia, how do you feel? Bangchan: So for the first time we visited Indonesia, Indonesia Stay was very enthusiastic, the energy was also very high, therefore we came here for the second time. Are there any special place you want to visit here in Indonesia? Woojin: I want to go to Bali, so when I was little, in Korea there was a drama called Memories in Bali, I watched it and wanted to visit Bali. What are your thoughts and impression about Indonesian STAY? I.N: When I arrived at the airport, there were a lot of Stays that came and made us touched. What do STAY mean to you? Hyunjin: STAY is the reason we are here, also because there is STAY, there are StrayKids. Those who are always waiting for our comeback, our songs, our performances and all kinds of them. Indonesian fans have been known to sing along with songs instead of only doing fanchant. How do you feel about that? Han : We are touched and grateful because even though our language is different they memorize our song lyrics and we can sing together. What kind of music genre would you like to try in the future? Changbin: We want to try many genres in the future, but the main thing about Stray Kids is the great energy when we’re performing so we want to continue our own genre of music that will give a unique color in any performance. This is your first tour. What are your thoughts about this? Are you excited? Seungmin: We just debuted so it’s not nearly a year. We feel this is a good opportunity to show our appearance and promote the name Stray Kids abroad. What are you expecting of tomorrow’s show? I.N: So first of all this Unveil Tour has made us happy because we can perform there, but tomorrow there is one special performance. Previously we also had a special appearance when in Thailand so Stay Indonesia must anticipate our appearance and so we can enjoy together. Please say a special message to your Indonesian STAY! Felix: We are honored and glad to be able to perform here for the second time and tour in Jakarta. This Stray Kids led by Bangchan has prepared their special performance at the concert on Saturday, January 26, 2019 at ICE Hall 5 at 6 30 PM. So, make sure you watch, STAY!